I’m really excited! Tomorrow I am going to be teaching my first art class to a group of about 10 children from the community where Renzo’s family lives. It’s about a 5 minute drive from the apartment. We are there a lot since it’s where most of Renzo’s family lives and it’s where his grandfather’s land is located. I already know a few of the children but am excited to meet some new little friends as well. I’ve observed the kids around there and they often seem at a loss for activities or things to do. They don’t seem to have much in the way of toys, bicycles, or even simple sports equipment like balls, etc. I’m hoping to provide the children with a fun outlet for their creativity and maybe expose them to some new skills. In return, I’m hoping to learn a little Spanish and teach them some English as well. Recently a beloved member of the community passed away, and she used to teach religion class to the children on Saturdays, so although I am by no means a replacement, I am hoping our class can help fill the void a little bit and help to continue in that spirit of community service to the children in the campo. Luz and Robert are very active in their community and they are such good friends to us so they happily agreed to host the art classes at their house. They have a nice long covered driveway and some folding tables so it’s a perfect setup to teach outside. Renzo is going to be assisting me, especially with translating, although I am going to do my best to speak as much in Spanish as possible. The children are SO forgiving in that regard and they love helping me learn new words. I know from talking to the kids that they don’t have art in school, but I’m not sure what their experiences are otherwise. It will be interesting to find out. I really can’t wait to see how they use the materials! DO YOU HAVE SUPPLIES YOU’D LIKE TO DONATE? 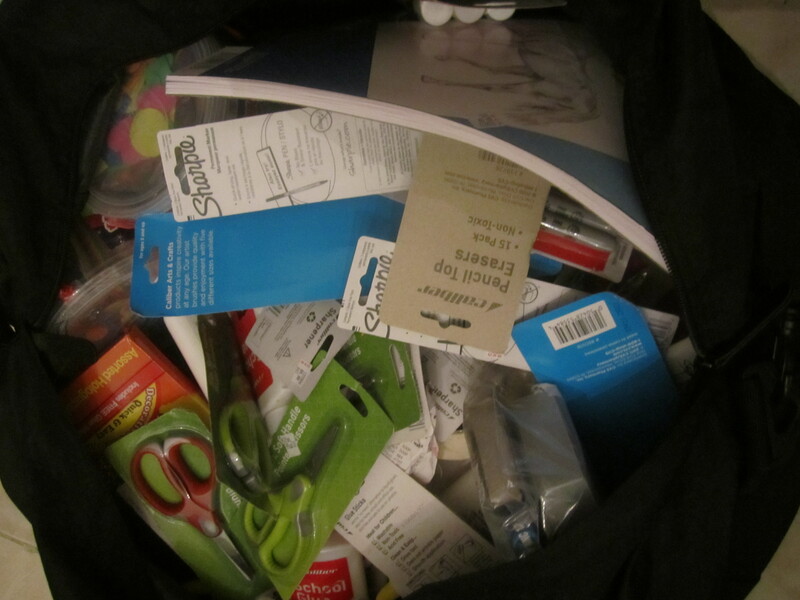 When I was back in NYC for Thanksgiving I spent a couple hundred dollars filling a big carry-on bag with art supplies for our class (the 10 pairs of scissors I bought ALMOST didn’t make it on the plane but that’s another story- THANK YOU kind hearted people at JetBlue as if I didn’t love your airline enough already!) however I would LOVE to collect any and all donations to add to our collection of supplies. If you have any excess art supplies (paper, pens, pencils, markers, crayons, yarn, ribbon, buttons, paints, etc) new or used, I would love to take them off your hands. Also, please save your fancy, shiny, holiday gift wrap paper & ribbon scraps…they are so cool and we can use them for collages! I will be back in NY for Christmas and would be happy to pick up anything you have to donate! Haha, yes Bobbie, I assure you we ARE really coming back! His blessings upon you guys!!!! I love you with all of my heart!!!! The art class looked like all of you were having loads of fun I am enjoying the blogs so much. The previous blog was amazing How much work went into clearing that piece of land. It looked amazing after it was cleaned up Looking forward to seeing you at Christmas. Thanks Titi, we love you too! Looking forward to seeing you during the holidays! Thanks Grandma! We did have so much fun- I’m really looking forward to seeing how things unfold! We went back to the land today to do more clearing & Renzo’s going back again tomorrow…lots of work (& lots of bugs)! Can’t wait to see you on Christmas Eve!